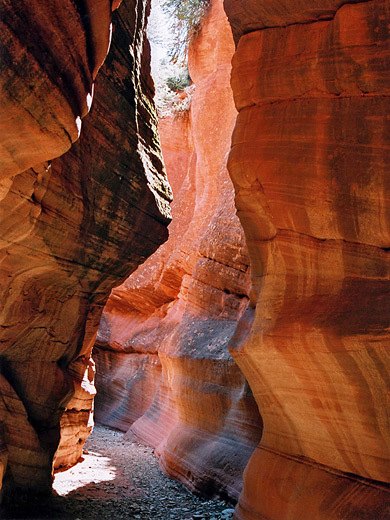 Like the similarly named Red Cave and Red Hollow, Red Canyon forms a colorful series of narrows through the deep red sandstone rock of the Glendale Bench, a few miles east of Zion National Park, although the drainage is a tributary of Kanab Creek rather than the Virgin River. 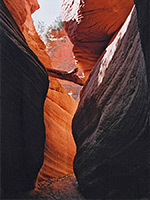 The canyon has about half a mile of enclosed, curving passages up to 100 feet deep, mostly without any obstructions, and quite easily reached from a main road (US 89); the canyon runs parallel to the highway about 2 miles from it, and may be accessed either by driving along a very sandy 4WD track or walking cross-country, hiking over a rolling, open landscape of dunes and occasional trees (the Sand Hills). 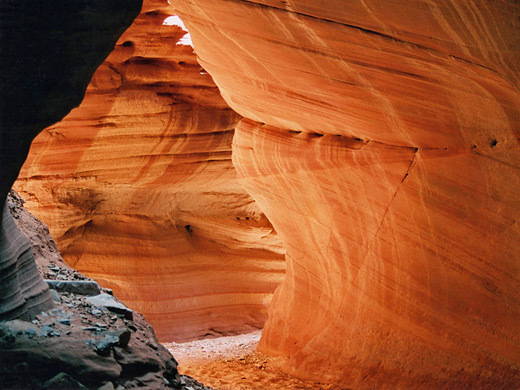 Adventure tour companies from Kanab sometimes take visitors to the slot, which is known locally as Peek-a-Boo Canyon, though the place is in general little visited compared to the more famous narrows within the nearby national park. A secondary road leaves US 89 a mile east of the turn-off for Coral Pink Sand Dunes State Park and runs eastwards alongside (to the north) for 4 miles, rejoining the highway shortly before it begins the descent into Three Lakes Canyon towards Kanab. The secondary road is partly paved, and it provides many good places to camp, close to the main road though mostly out of sight. The track to the canyon starts at the east end of this old road, by the junction with US 89, and is very sandy from the start, as it skirts around a large area of dunes, rises slightly to cross a low ridge then descends towards a dry wash where the surface becomes even softer. The remaining stretch is more level though still across deep sand, as the road curves east then back west just before the streamway, meeting it one mile downstream of the end of the slot. ATVs can drive along the streambed right up to the start of the narrows. The distance along the track is 2.8 miles. 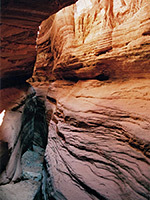 For hikers, the quickest way to reach the canyon is probably to follow the track for 1.2 miles, a little way after the sandy wash, then walk due north cross-country for another mile, over land that is quite open and relatively flat so navigation is easy - aided by distant cliffs rising above the dunes to the north - and the surface generally quite firm. Walking all the way on the track only adds about one mile to the overall journey, however. Note that the slot is quite separate to the more famous Red Canyon further north along US 89 - this is a partly wooded valley containing sandstone hoodoos, a few miles west of Bryce Canyon National Park. It is also not to be confused with Peekaboo Gulch, which is in the Escalante area. 9 views of Red Canyon. TopoQuest topographic map of Red Canyon. The wash is enclosed by low cliffs for a short distance below the slot, offering plenty of entry/exit routes before the walls become vertical and form the first section of narrows. 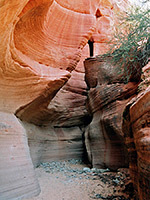 The Navajo sandstone here is dark red in appearance, typical of this region, and is eroded into delicate curves bearing graceful surface patterns, from thin horizontal bands of lighter rock crossed by vertical strips of desert varnish. 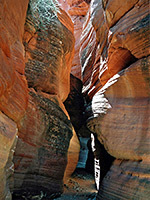 The first narrows are quite short, opening out to a sunlit section, but this doesn't last long as the drainage constricts again to a longer, deeper slot. Some parts are quite dark because of overhanging rocks above, and the smooth curving walls allow for pretty reflections and light effects, quite similar to canyons around Page in Arizona, such as Antelope. The floor is sandy and has no potholes to hold any water so the passages are largely unobstructed, until a 20 foot pour-off topped by protruding chokestones, a blockage not easily climbable. The nearest exit route to bypass this drop is quite far back. Above the dryfall, the canyon is not narrow for much further, soon becoming wider and less sheer-sided.